Yesterday I decided to take the piece of plexiglass I had picked up a few days ago and to go to my Studio and complete the framing of the 5th and last piece for the show of boardwalk prints that I have opening next week. Unfortunately, when I started peeling back the protective layer on the plexi, I found some major scratches in the surface. Not the kind of thing that would go unnoticed. I tried to stop by the glass place on my way home, but they were closed for the day. Was it possible that they would blend in to the white of the mat board and not be a problem? Tested it in the bright morning daylight and saw that this would definitely be a problem. Once again I tried to stop by my glass supplier, and found that even though the posted hours said they were open at that time, the place was definitely closed. Holiday hours maybe? Luckily, before leaving home I checked for other glass possibilities and found another glass place on the same road, just a little further to the south, so that became my next stop. And it was open, and they could make me something on the spot. Given options, I decided to go with actual glass this time. Slightly heavier, but not likely to get big scratches in it, and since I will be hand delivering it, I don't have to worry about the glass getting damaged in shipping. And cheaper, too. Test fitted it before I left to make sure it would fit. And because there was a pizza place right next door, grabbed a slice to go for lunch. After lunch I went back to the Studio to put it all together. I had mounted the print yesterday, so now it was just a matter of sliding everything into the frame, and tightening the screws on the fourth side. I still need to attach hanging wire to the back, but I have that at home and can take care of that there before I deliver it in a few days. And while at the Studio, I grabbed a few small pieces of plywood, as it's getting to be the time of year where I have to start working on this year's holiday card. I spent a little time thinking about possible inspirations yesterday, and will want to start on something within the next week. I woke up this morning with something I haven't seen in a long time- a week before I had to go to any of my jobs. Plenty to be done in those 7 days, but not with my employers. Today included some art related stuff, thus this blog post. 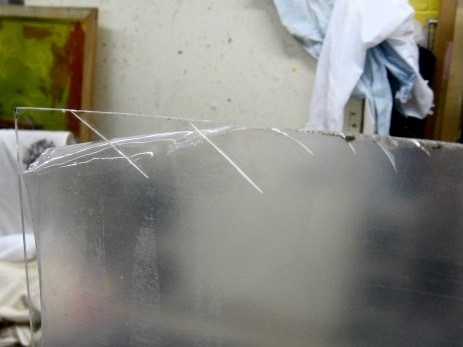 I had gotten a voice mail last week (while at work of course) telling me that my new piece of plexiglass was ready. On my first day off since then I was able to stop by, bringing the frame so I could test fit it before I left with it. The plexi fit just fine, so I paid for it and went on to my next stop. A few stops later was a visit to the Spring Lake Community House, site of the latest Belmar Arts Council show. The opening reception had been on Sunday evening (I was working and had to miss it), but I am told it was well attended. The large furnished room is used for a variety of purposes, not strictly an art gallery, but they did find a way to show all the chosen work, nearly 80 pieces. I was told that my piece was well lit, with a lamp right over it, as you can see from the above photo. And it's at a level that makes it easy to see. 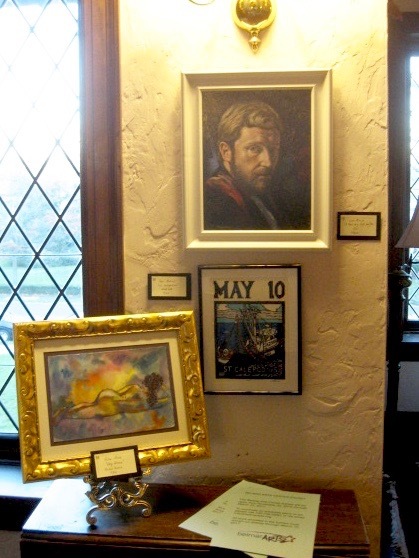 A lot of the work in the show is on high walls or in dark corners. More photos can be seen on the BelmarArts blog. This show remains up through March 12, 2017. I spent most of the day up in Somerset County today, a scheduled work related training. 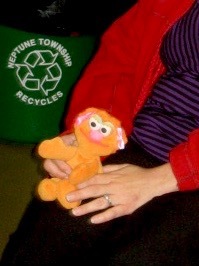 Luckily, the timing of this and for the drop off for the latest Belmar show worked out that I could take care of both. For the moment the home base of the Belmar Arts Council is still the Boatworks, the abandoned space we occupied and fixed up starting almost a decade ago. However nothing is permanent, and we don't own the property, so there's always a chance they will kick us out of there someday. And it always occurred to me that if we ran out of places in Belmar to meet (the two that were used before the Boatworks have been torn down), nearby Spring Lake might be a good place to look for space. This new show may have nothing to do with a search for potential gallery locations, and just may be an opportunity for members to get exposure. Deadline to enter was a few weeks ago, and last night I was wondering when we were going to hear what was accepted. Went to our website and found the list of accepted entries, and information that the drop off would be November 16th. Working in my favor was that I tend to work in common sizes, so that I had a frame at home that would fit my entry, so I spent a few minutes last night swapping it out. No particular theme, and I've never shown there before, so I had many options. Spring Lake is a traditionally Irish town, lots of Catholics, so I thought maybe go with a saint. Could lead to some interest somewhere. 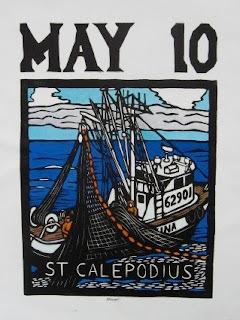 What I ended up selecting was St Calepodius, a martyr whose beheaded body was brought up by a fishing net- a nice print and a fishing boat could also spur some interest in this seaside town. What I did not realize until this morning was that I had been in the location before. Turns out that the Spring Lake Theater is part of the same building as the Spring Lake Library, what appears to be a rambling mansion on one of the town's main streets. A few years back Molly informed me of her plan to do a series of art lectures at Spring Lake Library, so I got word out to the critique group. Not surprisingly, the first lecture would be about herself, so she brought over stacks of her prints, and there was a long photo session. I entered through the library, then followed a twisting path up to a very large room on the 2nd floor where she held the talk. No one else from our group showed, but there was a pretty large crowd and it was an enjoyable evening. It was the last such event- never knew if it was Molly or the Library that ended the planned series. Another potential issue- it was noted this morning that a lot of works was selected for this show (almost 80 pieces) and many of them are large pieces. And while that room we were in today is large, the walls aren't really designed for hanging art. The hanging committee has their work cut out for them. At least my piece is small and can fit anywhere. Anyway, this show opens on Sunday, November 20th, with a reception from 5 to 7 pm. and remains on display through the spring. Only one day later than we had planned, we had the November critique. I was the first to arrive, about 15 minutes before the official start time. Long time regular Tim was second. Then Molly called to say that she was running late but would be coming and bringing beer. At that point we decided to move down the hall to the cafeteria. Long time regular Jane arrived as we were doing that. So we were just four tonight, but that meant we could spend plenty of time on each participant. Clockwise from the top, my framed collage/print back from the Belmar "Selfies" show, a quick drawing from Molly, a series of paintings from Jane, and on the floor, combined birds and prayers from Tim. Also present was this character, who I believe is called Zoey, and I was told it was important that I get a photo of Zoey and Jane and put on the blog as proof they were here. If I get more information as to why this was important, I'll update you. As for the art, my new/old piece got a good response. One participant has never been to a Waffle House, but knows of it, and that reputation was enough to add impact to the print. Apparently I have stumbled onto a particular known variety of selfie where the subject looks away from the camera. 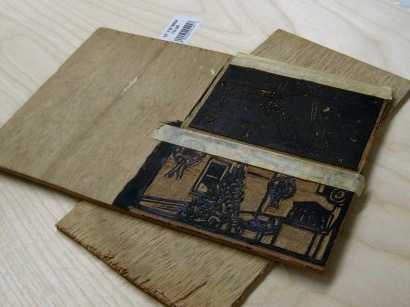 And since I first carved and printed that block in 1994, I continue to be a trend setter. As we move through November, I had a lot of Studio related business today. When I turned on my phone this morning I had a voice mail from Molly. Was she backing out of coming to tonight's critique group? Yes and no. Suddenly realized that she couldn't come tonight, but thought she could do tomorrow. Also, wondered if anyone had expressed plans to come tonight. I had sent out e-mails almost a week ago, and only had one reply- a no. Molly had no confirmed plans from her text messages. After a quick phone conversation, we decided to push it to tomorrow, and I sent out e-mails to my list with the changes. Last week while at the Studio I noticed piles of Christmas wreathes in the lobby and figured I should get some info about the plans to reclaim the first floor walls. Back in 2015, the first year of WinterFest, in early November, without warning, we found our art that had been on the first floor dumped in our Studio space, so I figured that would happen soon this year. I was told I could wait until this week to take it down. 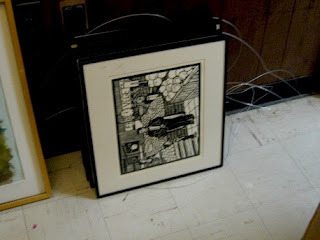 Then a few days ago we received e-mails saying that we had to remove the art from the walls this week, so I expected to come in a few days for that purpose. My display this year was 6 supermarket prints, and I have most of the framed ones stored in custom boxes I had used to ship them to Iowa for a show several years ago, so early today I stopped down in Manasquan and picked up one of those boxes. Got an e-mail a few days ago from the organizer of the Scene at the Shore show at OCC next month. A reminder of dates, etc. I had purchased the framing materials for one more piece a few weeks ago, but hadn't touched it since. This is one of the least busy weeks between now and the installation, so I planned to get that going soon. Being that the critique change was happening with short notice, I decided to go there tonight in case anyone didn't get the word, so I could tell them what happened. And I'd use the time and my big table to take on the framing project. 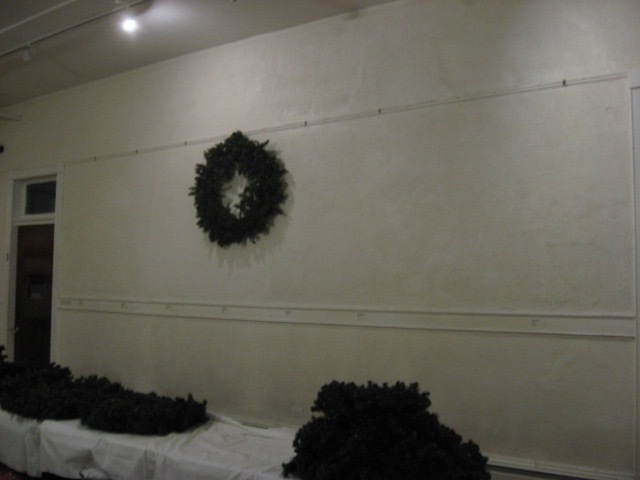 I arrived at the Studio building around 5 pm and found that the wall that a few days ago held 6 of my framed supermarket prints, which we had been told we had till the end of this week to take down, now just held a wreath. 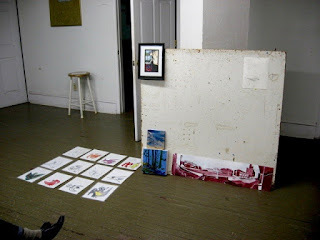 And the prints were not in the Studio either, though I found Molly's stuff there from her upstairs show. I found Ian in the office and asked him, and he showed me storage area (see below) where my pieces were stashed. So a slight change of plans. My print storage box that I picked up this morning was still out in my car, so I brought that in, packed the 6 framed prints, and carried it back out to my car. Now that task was done. I still wanted to deal with the frame, and I had plenty of time before the scheduled start of the critique (when confused people might show up), so I moved on to that. 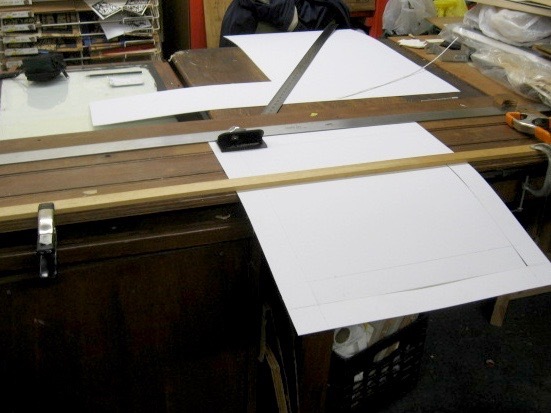 Before coming to the Studio I had grabbed the frame parts and the foam core and mat board I bought for this purpose. Everything else I would need I store in the Studio. So I got out my homemade mat cutting machine, set it up on my large studio table, and began that process. I haven't had an occasion to cut a mat for a while, but the procedure came back to me quickly, and by 7 pm I had assembled the frame, cut a backing board, and created the window mat for the front of the frame. Got everything put away and loaded up the car by 7:30 pm. No one had showed. so I guess they all got the message about the change. Still need to get some plexiglass, so I should stop at the place soon and order it. Mounting the print and wiring it for hanging won't take long. About halfway through the fall semester, and working is pretty much taking up most of my time. Last week my 2D Design class started their woodcuts, and this week a few fast working students were ready to pull some practice proofs. Brought in water based ink, which made it easy to clean up that day, and the students were pleased with the results. Maybe they'll be even happier with better ink next week. 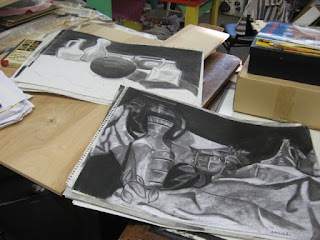 That same 2D class did their final charcoal drawings two weeks ago, and I've been toting them around ever since, waiting for an opportunity to grade them so I can return them. And now my drawing class is finished with their last charcoal pieces, so today I had two classes worth of charcoal drawings to grade. Had time for a short Studio visit today, so I decided to take advantage of my big table to take care of a potentially messy task. At least that thing is now done. 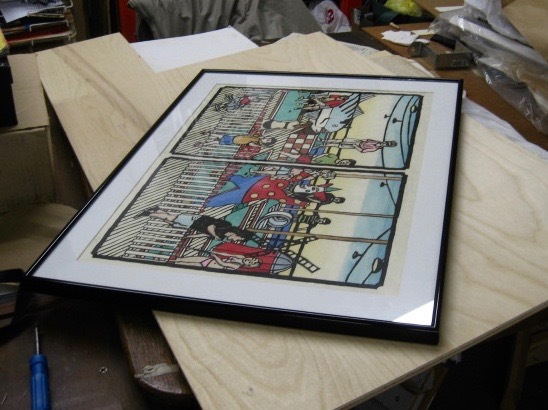 I should go ahead and complete the framing for the 5th boardwalk print soon, including getting a custom piece of plexiglass. That show is about a month away.